With a total of 50,000 visits a month, the Lone Sheep network of newspapers is the option of choice for accessing the broadest West Kootenay audience. Why choose an online newspaper? Online advertising shows the public that your business is connected and forward-thinking. Studies show that most people now go online to find information about purchasing or entertainment decisions. Your ad in an online newspaper is crisp and colourful--and it links to your business’s home page or online flyer. So besides performing the traditional function of the newspaper ad, it also serves as a portal for people interested in finding out more about what you have to offer. Who reads our online newspapers? In short, the people you need to reach. 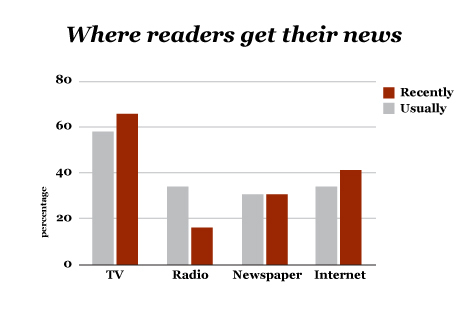 People who read our online newspapers are active, educated, and engaged. The online audience earns and spends more than those who primarily read print newspapers. These people expect to find information about what they do and buy online: the vast majority would never consider looking for important information in a print newspaper. Lone Sheep believes in the principle of knowing what you get for your advertising dollar: we like to call it “Accountable Advertising.” In this day and age, every last dollar must be maximized. Our publications offer the only advertising medium in the Kootenays that can tell you exactly what you are getting for your advertising dollar. We can tell you exactly how many people visit our sites, where they live, how often your ad is seen, by who and how often. Each month our invoices include all of the pertinent statistics that prove your ad is working for you. The owners of a print publication can tell you how many copies of their newspaper they print and distribute, but they can’t tell you how many of them are read. Even people who subscribe to a printpublication may look at it infrequently, if ever. Online newspapers offer something new: accountable advertising. We can tell you exactly how many people read our newspapers and where they live. Exactly. All of our readers are ‘volunteers’--that is to say, they make a conscious choice to seek out and read our newspapers. We do not send out spam and every unique reader in our statistics is exactly that, a unique person who has actively sought out our site...and your ad. If you are interested in gaining a copy of our media kit, featuring information about Lone Sheep circulation figures, and our advertising rates, please use our contact form.